Doesn’t that sound fantastic?! It’s like one of those British murder mysteries that takes place on a dark and stormy night, except that the dark and stormy night lasts for more than half a year, and even if the children survive, their father may have fallen to enemy forces…so chances are they could still die once they return from hiding! I don’t know – I thought it was pretty fabulous. Of course, I’m part Norwegian, so the idea of being essentially held captive by winter is practically a birth right. I’m also half Italian though, so the thought of all that dried fish with no garlic in sight…the thought alone is real torture. Seriously though (as if I could be serious – the sun is shining, I’ve gotten to ride my bike every day this week, and I’m eating brownies – seriousness is a far distant cousin to what I’m feeling right now), I wanted to discuss this book as a companion to Winterling. It’s also a YA title with a young female protagonist, but they’re written so differently. As much as I enjoyed Winterling as a spunky little novel about magic, this book is a much more refined approach to both the genre and the targeted age-range. Kirby’s ability to capture the oppressiveness of his setting, combined with a plot that’s subtle, surprising, and at times (no pun intended) chilling, is a real gift for those of us who enjoy fiction aimed at a younger audience. When I was considering this book again, I went to Kirby’s blog and noticed that, along with his writing career, he’s also a school psychologist. It’s clear that this second job, which he’s probably had much longer than he’s been a published writer, has greatly informed his work and educated him on material necessary to turn this unbearably confining setting and its many conflicting characters into a taut, suspenseful story. When reading his book, I trusted his characters, I believed they were responding to the overwhelming bleakness of the situation in a realistic way. Such a trust is a hard-earned privilege, and once an author has gained it, he has a duty to live up to for his readers; I was not disappointed. 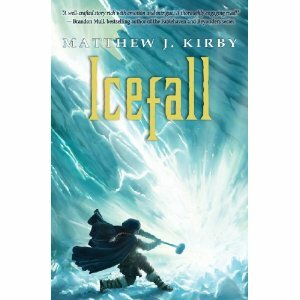 Kirby blends a coming-of-age story about a young woman with ancient Norse mythology and a heaping dose of battle and intrigue – he’s written a book that easily appeals to wider audience – and one that made me love it even more for its unexpected warmth and delicately wrought charms. Matthew J Kirby has a great site and blog here. Wonderful book (for those with even more Norwegian) and bravo to Kirby for winning the Edgar in the Juvenile Fiction category! (fun picture on his blog of him with Neil Gaiman! )Thanks for the comparison of the two books. Sometimes I just get lucky when it comes to finding a couple of books that run parallel to each other (at least enough that I can catch a hold of each and weave a few threads together)!